Last week was a busy one (two evenings at work) and I stopped by home on one day to pick up the curtains for our living room as my mum had shortened them for us. It has made a huge difference- making it much lighter in the day (the doors have these so-called clever blinds inside the glass, but in reality it takes about 20 minutes to wind them up or down, so we tend to leave them down but open, which cuts out so much light) and much cosier in the evenings. 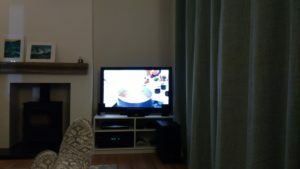 I caught up on some of Bake Off one evening, enjoying how cosy the living room now feels (I did not like it before when people could potentially see in). 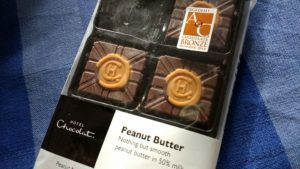 As a treat for a busy week Andy gave me these amazing peanut butter chocolates- they are possibly the king of chocolates. We were meant to be going to Croatia on Friday for half term, but we were flying with Monarch, so when that went all wrong it basically meant we had to cancel (the only other airline that flew there were Ryanair and we are not risking them, plus they put the prices up loads anyway). Andy had the great idea of heading south-west to visit the Eden Project, as we’ve both wanted to go for ages but it’s so far (you could fly to New York in the same time pretty much). After work on Friday I had booked a massage (which I arrived very stressed at, because there were no parking spaces in the normal car park, so I found one further one, ran to the pay machine but it was only a sign and not a machine, ran to the next one, paid, grabbed the ticket and ran back to my car only to realise it was the receipt of the person before me and not the ticket, so then ran back all the time worrying that someone would get there before me as I had no cash to buy a second one, got it out of the machine just in time, ran back to my car and then ran to the building feeling very flustered indeed), and then had a little wander around town to get us some breakfast for the next morning. After dinner we packed and drove to the hotel. We’d booked a Friday night stopover at the Premier Inn in Andover- normally I look into parkrun locations but being busier than usual Andy took this on for me, and found that the start of Andover parkrun was half a mile away- perfect! The run from the hotel was along an industrial looking road with loads of warehouses and things (Portway industrial estate according to the map)- I was really wondering if I was in the right place. But at the end of the road I could see cars (and people wearing high-viz driving them) turning off down another road, and there was suddenly a huge park. It was a lovely location, but I really should have worn trail shoes as it was pretty muddy in places. I had a bit of a grump (not really a panic) on the run down as my watch wouldn’t find the GPS- I decided I could use Strava on my phone instead (because otherwise it didn’t happen…), but once I got there and googled, I did a soft reset which seemed to work- phew! My cow cowl worked (once you have run 20 UK events you can buy one- it’s not an official parkrun item like the milestone t-shirts, but it means tourists can identify each other)- I ended up chatting to a guy called Kevin who usually ran at Bedfont Lakes, but was travelling to Exeter to watch the football. He was a total uber tourist- this was his 99th different parkrun event! I had my Panshanger top on and he’d been to the inaugural event there and we chatted about the finish (it used to be straight up a horrible hill, but now they’ve changed it to a zig zag which I think is just as tough as it goes on for longer). The new runners briefing was great as usual- they had a map but as they were following a different course due to works around the lake, it didn’t matter. Although the person did say the parkrun sin of “winner” (gasp- it’s not a race…)- basically saying that unless you’re going to run it in 15 minutes, just follow the person ahead. It was two laps which I always find passes fairly quickly, and you don’t have the monotony of a higher amount of laps. Plus in the middle you pass by the start/finish area and get a big boost from all the scanners, timers and funnel people. The course had a few out and back sections with tight turns- it was narrow in places as we had to keep to the right of the path (as other runners were coming in the other direction) but I wasn’t in a hurry so I didn’t mind being stuck behind people for a bit. The lakes had been partially drained, but I imagine that normally it would be really pretty. On the second lap I took my phone out to take a photo of all the mud on the field- it didn’t seem that bad on the first lap but I suppose by the time I got to my second lap it had been churned up several hundred times. I ended up running 28.35, 162/293- I didn’t expect it to be that busy. As I was on my second lap it began drizzling a bit before easing off, and as I finished it started to rain pretty heavily. I was going to stay around for a bit of a chat, but the rain made my decision for me. On the run back my watch beeped to tell me it was going into power saving mode- argh- I thought I had pressed go but clearly not (for the run back). It was raining pretty hard so I put my cowl/buff thing over my head to keep my hair dry. 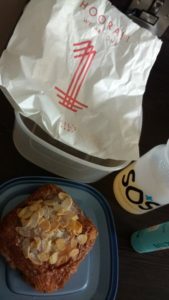 After a shower we had a breakfast of a chocolate almond croissant (plus a nuun tab in water for me), before heading towards Exeter for the rest of our little holiday (I’ll save that for another post). So that was my 31st different parkrun event (30th UK one). 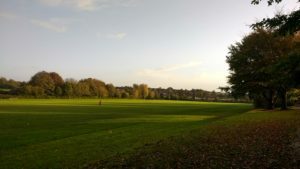 To keep track of my parkrun touristing I have made a page of all the links here, which you might find useful if you are planning on visiting any of them. Do you know of any good hotel and parkrun combos? Any car park stresses? I really don’t like pay and display anyway, I’d much rather pay when I leave because then I am in no hurry and if I need to get change I can get it while I am in town. Author Maria RunsPosted on October 27, 2017 Categories General ramblings, Running, Stuff I love! Ooh that course looks interesting with the loops. Andover isn’t crazy far from me (well maybe an hour I guess). I heard someone chatting about it when I was at the Basingstoke parkrun. Yes I agree about the parking. So stressful! It looks complicated, but really it’s two laps with some twisty bits, and so you just follow the instructions. Not sure about the parking but it seemed to be in a leisure centre right by the park so should be fairly easy to get to. Previous Previous post: Bright10 2017, bad things coming in threes and a power cut! 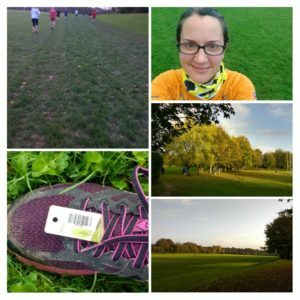 Next Next post: Castle Park parkrun- Queen of Herts!